Is your car in need of that extra bit of TLC? Do you wash it but feel like there are bits that need more attention? Perhaps you read our “Learn the essential of car care” blog and now you’re wondering what’s next? While shampoo and wax can make your car’s paintwork shine, there are other areas which need more specialist care in order to achieve the same levels of cleanliness and finish. One of these trickier areas is wheels. They get more dirt splashed onto them and more stones flying at them than the rest of the car, so your tyres and alloys can quickly start to look old and damaged. When you’ve spent time making your paintwork look beautiful you don’t want your wheels to look shabby. 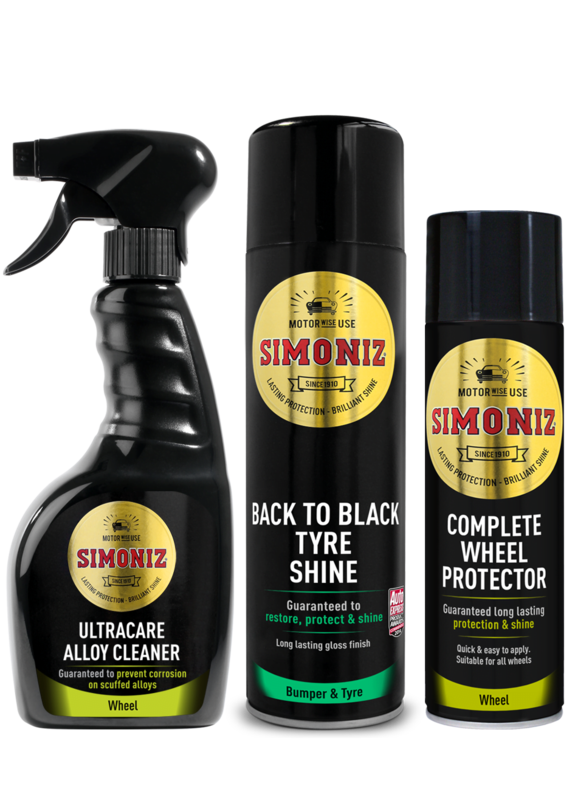 Simoniz have 3 specially developed wheel products which can be used together to clean and protect your wheels, leaving them as beautiful and shiny as the rest of your car. Firstly there’s Ultracare Alloy Cleaner. Spray this on to dry alloys and it will quickly clean off the road grime, brake dust and dirt. Most alloy cleaners contain acid which can be corrosive if your alloys are scratched, but Ultracare cleans effectively without acid so there’s no damage. Simply rinse after using to reveal beautiful shining alloys. Next there’s Back to Black Tyreshine. Spray this on to your tyres and wipe away to restore them to their original black, getting rid of scuff marks and faded patches. Finally, use Complete Wheel Protector to coat your wheels and protect them from dirt and weathering, to keep them looking better for longer. Bumpers and trim can also become faded, scuffed and worn over time, losing their original black lustre. Back to Black Bumpershine restores bumpers to their original showroom finish – simply spray on and wipe to make them look as good as new. Matt Dashboard Wipes – Keep your dashboard clean and remove marks to restore it to an original, matt showroom finish. Quickshine Detailer Wax – This is great for spot waxing and topping up between waxes, to add that extra touch of shine to your car’s exterior.